Composed by Helmut Bornefeld. This edition: Complete edition. 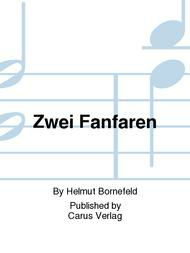 German title: Zwei Fanfaren Fur Blechblaser. Single Part, Trumpet 1. Composed 1970. BoWV 237. 2 pages. Duration 4 minutes. Carus Verlag #CV 29.237/31. Published by Carus Verlag (CA.2923731). Score available separately - see item CA.2923700.